I have finished the first of the socks I started last week. There were many firsts in the knitting of this sock. This is my first toe-up sock. 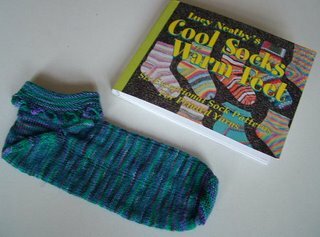 This is the first sock knitted from Lucy Neatby's Cool Socks, Warm Feet book. I had to learn how to do a provisional cast-on, which was OK - I can learn new techniques. They have a Bosnian style square section in the toe - not sure about this, it doesn't seem to be the right shape for my foot. They have a Turkish heel - this is apparently a type of heel-shaping invented by the devil himself for the torment of knitters. I will never do another one - I am so set against the Turkish heel - which was a complete pig to knit, doesn't fit my foot and leaves big holes at the point where the heel section meets the ankle - that I will be trying something else for the second sock. Also this sock has no gusset shaping in the foot so it's too loose and I like my socks snug. There are things I like about this sock though - I like the wool which is hand-dyed from Get Knitted. And I love the crenellated, picot edging to the cuff (though I should have knitted the ankle a bit longer). 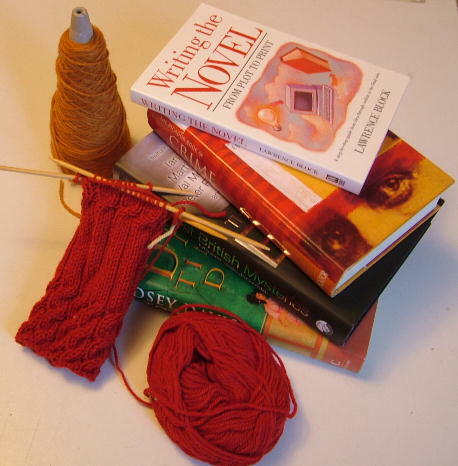 I just need to rectify all these other faults in the second sock, then re-knit the first one to match. I can do that, right? I have finished The Italian Secretary by Caleb Carr. I liked it, it seemed to me to be true to the Sherlockian originals, but I'm not sure I would read another one. Of the two I had for reading group, I'd have to say I preferred the Laurie R King one which was Locked Rooms. I was surprised at this. I'd definitely read more of the Laurie King series, in fact I've already added a couple to the TBR pile. Anyway, I'm now on Snow Blind by P J Tracy. I've enjoyed the others in this series and I like the detectives, Maggozzi and Rolseth. In this one they team up with a rookie sheriff when someone starts killing cops and leaving them in snowmen. Ooooh, I like a good serial killer.